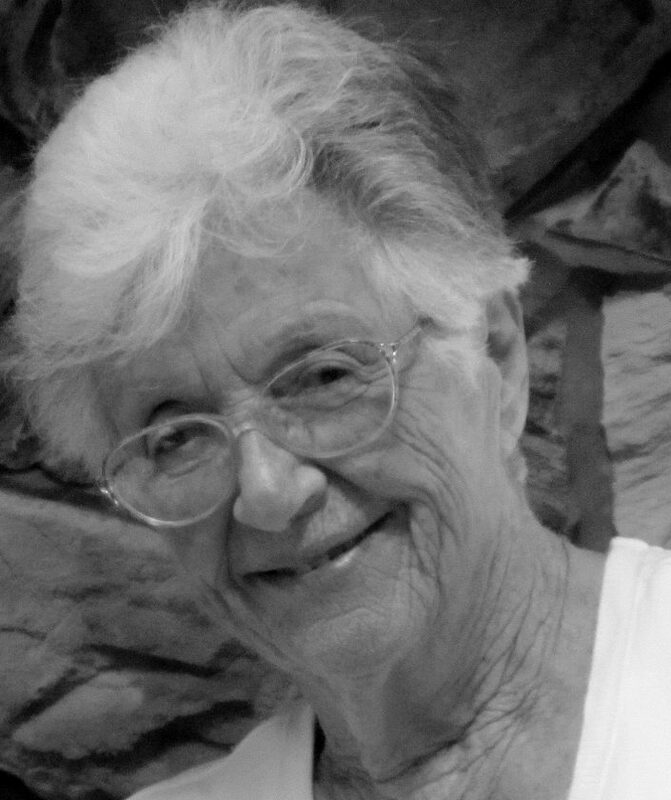 Eileen Marie Ballard, of Lock Haven, Pa., passed into new life on Feb. 5, 2019 at 97 years of age. Eileen was born on June 25, 1921 in Remus, Mich., as daughter of the late Alex and Marie Ruetz; cherished wife of her late husband Charles for 71 years; beloved sister of Sister Rita Ruetz and Bob (Bonnie) Ruetz and the late Betty (Bob) Byram, Jack (Dolores) Ruetz and Helen Ruetz; loving mother of Ann (Don) Stone, Dave (Joanie) Ballard, Tom (Dawn) Ballard, Mary Jo (George) Kuczynski, Sue (Marty) Desmond, Jim (Ellen) Ballard and John (Lisa) Ballard; dearest grandmother of 19 and great-grandmother of 17 children. Eileen enjoyed reflecting on her life growing up on a farm in Remus, Michigan. Being the oldest of six children she worked in the field with her dad. Possibly these early farming days helped develop Eileen’s ‘green thumb’ and a love for animals. Eileen graduated from Central Michigan College with a teaching degree in business. She taught high school for several years in Petoskey, Michigan. Eileen became a stewardess (flight attendant) for United Airlines and was in New York City when WWII ended. Her child raising years were filled with activity and guidance. She made work fun by working alongside her children and encouraging them with her words of appreciation even if the bed was not made well. She always recognized the effort to help her out. When her children were grown, she worked alongside her husband Chuck, as an office manager for Haven Homes in Beech Creek, Pa.
Eileen enjoyed reading and was a lifelong learner. She liked walking with friends and family, Tai Chi and yoga. Eileen was a great cook always excited about a new recipe she could try out for family, friends or tailgating for a Penn State Game. Eileen spent many days and weeks sailing on the Chesapeake Bay with her husband Chuck, letting the wind guide them and renew their spirits. She took up the game of golf with Chuck when they wintered in Florida during retirement. In her 60s Eileen lost much of her vision but when asked how she could play golf and not see the ball she replied, “You just have someone line up your ball for you.” This is how she lived her life as a positive thinker and amazing role model. Eileen enjoyed traveling with Chuck. Some of their favorite vacations were to Israel, Egypt and Alaska. They also traveled to visit their children and grandchildren who are spread across the United States. What a joy they brought when they arrived for weddings, graduations, baptisms or a simple visit to just be with family. Eileen devoted her life to the care of her family with a kind listening heart. With a humble and generous presence she gave to others. Her Catholic faith gave her guidance throughout her life. Eileen will be deeply missed by all who knew her. Her spirit of love lives on in the hearts of her family and friends. A Mass of Christian Burial will be held on Saturday, Feb. 9, 2019 at 9 a.m. at Immaculate Conception Catholic Church, 310 W. Water St., Lock Haven with Father Jozef Kovacik officiating. Interment will follow at St. Mary’s Cemetery. Friends and family will be received at the Moriarty Funeral Home & Crematory, 112 E. Church St., Lock Haven on Friday, Feb. 8 from 6-8 p.m. In lieu of flowers, memorial contributions in Eileen’s name may be made to Howard Lions Club c/o Fred Kellerman, 302 Dell St. Bellefonte, Pa. 16823 or the charity of the donor’s choice.